Preheat oven to 175c. Using a fairly deep and long baking tray, spread enough baking paper to cover the bottom of the tray. 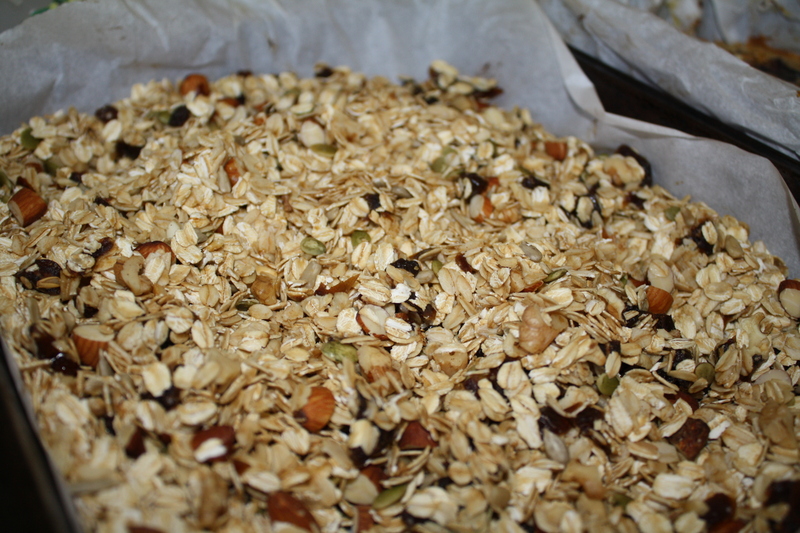 Pour the bag of oats onto the paper and spread them out. Scatter all the nuts onto the oats and using a spoon combine the mixture well. Cut the dates up into small pieces and scatter throughout mixture. Pour the coconut oil throughout the mixture and drizzle enough honey over the mixture until most of the top layer is covered. Using a spoon, mix all the ingredients once again before putting into the oven. After five minutes stir the mixture again and pop back into the oven for a further three minutes or so. Let the muesli cool and then serve with natural yogurt, cinnamon and either shreddedapple or some strawberries. Enjoy, YUM!